The final eclipse for 2016 will occur on 16 September, with the maximum Penumbral Lunar Eclipse visible at 18:55 UT (source: http://eclipse.gsfc.nasa.gov). A lunar eclipse, always coinciding with a full moon, can present a very powerful healing opportunity, especially for releasing and transcending repressed emotions which may have been embedded in our cellular memories for many life times. My spirit guide Thoth actually used the word ‘sticky’ to describe the nature of human feelings. It is the sticky quality of negative emotions which made them more tangible and identifiable than thoughts, hence serving as ideal catalysts for our spiritual transformation. Emotions are generated by chemicals in the body and interpreted by the nervous system as to their quality, that is, either uplifting or life draining. The latter type of emotions is generally heavy in carbon (or carbon-like) composition; tends to stick to our nervous system and cellular memories; and causes Light to be trapped within the affected chakra(s). Light is an agent to awaken our higher intelligence and sharpen our mental and emotional awareness. When Light is constantly being trapped or stuck in any part of our energy system, evolution into greater awareness is hampered. Consequently we continue to attract conditions and situations which cause the body to generate the exact same chemicals which bring about the associated negative feelings, again and again. According to Thoth, the truly effective way for the mind and body neurology to break away from such a vicious cycle is to increase the flow and frequency of Light through our energy system by practising non-attachment to thoughts and emotions. 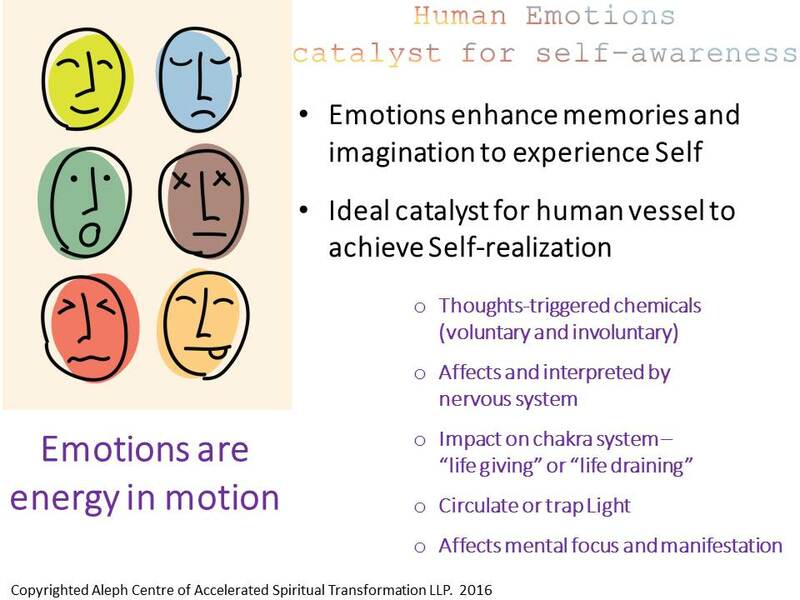 If we can appreciate the higher purpose of ‘sticky’ emotions as signposts for spiritual growth, we’ll be in a better position to embrace, heal and re-pattern them back to pulsating, moving Light. At last week’s Light Synthesis Workshop, Thoth shared a simple yet powerful meditation, most appropriate for cultivating mental and emotional awareness. It will also offer the benefit of emotional healing, should you be triggered by tomorrow’s full moon lunar eclipse to re-experience the ‘sticky’ emotions imprinted in your cellular memory. The best time to perform the meditation is during the eclipse (16 Sept, 16:54 UT to 16 Sept 20:54 UT) or as close to this timing as reasonably possible. I am not my emotions. With the Will of God, I manifest joy and abundance.